Over the past three-and-a-half years, as his pastor, I’ve gotten to know Dale a bit. Because Dale, who was never a talkative man from what I have gleaned, was increasingly silenced by illness in this period, some of what I’ve learned about him has come from others. One day, for example, while visiting Dee at her house, she showed me a beautiful piece of furniture that Dale made for her dining room. He was a tremendous carpenter! From that, I learned something else about Dale (and Elaine): whatever differences in their personalities, these two who grew up as classmates in a rural Michigan one-room schoolhouse, were a team. Dale smiled when Elaine said things like that to me. It was the smile of recognition of a “discussion” they had rehearsed countless times before. Sometimes, Dale’s smiles would turn into laughter that I loved to hear: the breathy, hearty laugh of someone truly tickled. I came to know Dale also as a man of great intelligence. On top of all this, Dale was a man of quiet faith. He was always anxious to receive Holy Communion during our visits. Even when it had become a struggle for him to move his hand to his lips, he determinedly ate the bread and drank the wine that are Christ’s body and blood. And no one ever more sincerely thanked me for bringing the Sacrament to him. Dale was truly grateful for the grace and love of God, whether he saw it in the meticulously engineered beauty of the created world or in the gift of Jesus on a cross, Whose death and resurrection brings eternal life to all who turn from sin and believe in Him. And it is to this I want to point all of you who grieve Dale’s passing today. At one level, Dale’s death brings a story to a close. With that, there will be, understandably, some sense of relief. Dale had suffered from multiple maladies over an extended period of time. His suffering is ended. But his death is a sad ending for all of you, too: A father, a grandfather, a friend, a strong presence, is gone. But you can take heart. You can have hope. Dale’s passing is also a beginning. The Gospel lesson from John which I read a few moments ago tells the story of what happened one day when Jesus went to Bethany, the hometown of friends: two sisters and a brother named Martha, Mary, and Lazarus. But to Martha in her grief and her confusion, Jesus says, “Your brother will rise again” and “I am the resurrection and the life. Those who believe in Me, even though they die, will live and everyone who lives and believes in Me will never die.” He then asks Martha to trust those assertions. Jesus asks her to believe them, to believe in Him. Jesus asks the same thing of you this morning. You see, if the promise that Jesus makes to share His Easter victory over sin and death isn’t true today, it isn’t true. It is precisely for moments like these that Jesus makes His promise to be the resurrection and the life! And our faith in Jesus’ resurrection promise isn’t just a hope whispered against the grim realities of life. After telling Martha that all who believe in Him will live with God forever, Jesus gave a sign of His capacity to make good on His promises. He stood at the place where Lazarus' body had been placed some four days before and commanded his friend’s dead bones to come back to life on this side of eternity. The voice of Jesus, God in the flesh, spoke with the same voice as the One Who called the heavens and the earth to life in the first place. In response to the command from that voice, Lazarus stepped out of his tomb, back into the embrace of his family. Fortunately, God recognizes how hard it is for us to believe such good news, especially on days like these. That’s why He sends the Holy Spirit to any of us who want to believe. If we will pray to the God the Father in the Name of Jesus, the Holy Spirit will help us to believe in the same Lord so welcomed by Dale every time he gratefully received the Lord’s Supper and listened to God's Word...the same Lord he so reverenced every time he joined the Saint Matthew family for worship over the radio on Sunday mornings. In the days and years ahead, you will miss Dale, just as you have missed Elaine. Grief is natural and understandable when the love runs deep and the memories are piled high. But those who follow the risen Jesus don’t grieve like others do. We have hope. We belong to a Savior Who rose on Easter. Because of Jesus, Dale will rise too. So will all who believe in Jesus. Why mild? Of all the epithets that could be applied to Christ this seems one of the least appropriate. For what does "mild," as applied to a person, conjure up to our minds? Surely a picture of someone who wouldn't say "boo" to the proverbial goose; someone who would let sleeping dogs lie and avoid trouble wherever possible; someone of a placid temperament who is almost a stranger to the passions of red-blooded humanity; someone who is a bit of a nonentity, both uninspired and uninspiring. This word "mild" is apparently deliberately used to describe a man who did not hesitate to challenge and expose the hypocrisies of the religious people of His day: a man who had such "personality" that He walked unscathed through a murderous crowd; a man so far from being a nonentity that He was regarded by the authorities as a public danger; a man who could be moved to violent anger by shameless exploitation or by smug complacent orthodoxy; a man of such courage that He deliberately walked to what He knew would mean death, despite the earnest pleas of well-meaning friends! Mild! What a word to use for a personality whose challenge and strange attractiveness nineteen centuries have by no means exhausted. Jesus Christ might well be called "meek," in the sense of being selfless and humble and utterly devoted to what He considered right, whatever the personal cost; but "mild," never! Proof-texting is what happens when people choose a passage of Scripture to prove a point they want to make without taking the rest of the Bible into account. * Proof-texting is destructive and un-Christian. A central principle taught by Martin Luther for understanding the Bible is to "let Scripture interpret Scripture." In other words: pray, read, think, and reflect on what the whole Bible reveals of God's will on a given subject. This will give you a clearer picture of God's character and of God's will for your life. The proof-texters look at this and claim that it means that human work is a curse for sin. One of my factory co-workers was fond of repeating a mantra during our breaks and lunch times. "Live in hope; die in despair," he would say sagely between drags on cigarettes. That "little ray of sunshine" was based in part on his viewing Genesis 3:17-19 in isolation. He believed that God had decided to punish the human race, including punishing us with work to do, long before he was born. In other words, from the beginning, before the fall into sin, human beings were meant to work. Work is not a curse; it's a privilege. But something happened to our work after the fall into sin. As surely as death became part of the human life on earth after the fall, so did the burdens of futility and self-service in our work. Sin--not work itself--is what can often make our work hard or futile. Sin lay behind all the watercooler gossip that can make work hard. Sin lay behind the "It-can't-be-done" jeers directed at workers who have dreamed, innovated, researched, or striven through the centuries. Sin lay behind the laziness that ruins productivity--ours and others. Sin lay behind bosses who shortchange employees and consumers. Sin is what causes employees to miss deadlines, cut corners, skip out early, and even swipe money or supplies from employers. It isn't work itself that's a bad thing, it's the inborn condition of sin we bring to work as descendants of the first parents and all the sins we commit because of that condition that can make work hard or futile. 9How long will you lie there, O lazybones? No work we do will earn us a place in God's kingdom, of course. (Also see here.) The gift of eternity with God belongs to those who repent for sin and take Christ's outstretched hand of forgiveness and grace. But that's no license for the faithful to sit on their blessed assurance! Christians should hate the thought of anyone having legitimate reasons for saying of us that, as the phrase goes, we're so heavenly minded we're no earthly good. Work is a privilege. Do it for as long as you can in life and do it to the glory of the One Who made you and Who sent a Savior to set you free, eternally, from sin, death, and futility. Ephesians 6:7 in the New Testament says, "Render service with enthusiasm, as to the Lord and not to men and women..."
Work because it's part of what makes us human...something that will keep being part of what it means to be human for those who live eternally with Jesus Christ. *It also happens when people flat out misread a passage of Scripture. One of the most widely misread passages of the New Testament is the one in which people tells us to take up our crosses. Many look at that and figure that Jesus is referring to adversities that come our way as a cross. Jesus is portrayed as pushing an attitude that combines stoicism and self-pity. People don't consider what the cross was for Jesus. Through it, He bore our sins. Our crosses are our sins. To take up our crosses means to honestly acknowledge our sin and our need of Christ. It means being honest before God and the world, that we, by our inborn nature, fail to love God and fail to love others; that we deserve the punishment for sin that the sinless Jesus took for us. It means submitting our old sinful selves to daily crucifixion so that God can remake us into the people we were made to be. It's only in honestly taking up our crosses that the freedom from sin and death Jesus won for repentant believers in Him can come to us. Adversities that come to you--from small to tragically shattering--are not your cross. Sin, the only thing that has the capacity to destroy you for eternity, is your cross, and we must submit to its destruction through honest daily repentance and renewal from God. Jesus says take responsibility for your sin and come to Him. He will make you new. **A superficial consideration of all the great things we have in the world because somebody worked--from the light bulb to the computer chip, from the food on your table to the music you enjoy on your iPod--will demonstrate that work itself is no curse. There's some overlap with this morning's discussion. But there's some other stuff here you might find helpful. "Give in! Get close! Clean up! Get down!" At Saint Matthew Lutheran Church in Logan, Ohio, we're reading the Bible together in a year's time. During this past week, we've read the Old Testament book of Deuteronomy, chapters 1 to 21. On Wednesdays every week, we have hour-long discussions, one in the morning and another in the evening, of the latest readings. This is the morning discussion from today. I hope that you find it helpful. 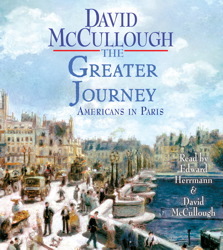 That's the subtitle of David McCullough's new book, The Greater Journey. It looks interesting, as usual when it comes to anything McCullough writes. ...you're dying inside. It's as simple and as true as that. ...follow the example of our Lord [Jesus], who answered His critics so often with silence. Our Lord defended other people. He defended the Word of God. He defended the work of His heavenly Father. He defended little children. Yet He never defended Himself. Usually you will find it wise not to answer your critics, tempting though it may be to do so. "Answer not a fool according to his folly, lest thou also be like unto him" (Proverbs 26:4). Ask yourself what answering criticism will achieve. Your friends don't need an answer, because you retain their confidence. Instead, listen to the criticism objectively. Don't allow yourself to become emotionally involved. Sometimes you can profit from criticism. If the criticism is just, do something about it. If the criticism is unjust, ignore it. On the other hand, if your enemies criticize you, so what? That's what enemies do. And remember that unjust criticism is often a backhanded compliment. It often indicates that you have excited the interest, jealousy, and envy of the critic. As the old adage goes, "No one ever kicks a dead dog." In my sermon this past Sunday, I talked about the decision we all have to make about whether we're open to believing in the God revealed in Jesus Christ or not. The time is short. Eternity is long. It is the time of decision. Those who are true to the word and confession on earth will find Jesus Christ standing by their side in the hour of judgment. He will acknowledge them and come to their aid when the accuser [Satan, who wants God to give him authority over us in eternity, by virtue of our undeniable sinfulness] demands his rights. All the world will be called to witness as Jesus pronounces our name before his heavenly Father. If we have been true to Jesus in this life, he will be true to us in eternity. But if we have been ashamed of our Lord and of his name, he will likewise be ashamed of us and deny us. God loves us desperately. That's why Jesus died on the cross. That's why Jesus calls us to repent and believe in Him. When we believe in Him--meaning, when we trust in Him and Him alone for life, we are given an undeserved share in His resurrection, His Easter victory over sin and death. What decision have you made? Do you believe in Jesus Christ as your God and Savior? And if you've made the decision for belief, do you love your neighbor enough to present this critical decision for or against faith in Christ to them? Your eternity and the eternal destinies of others depend on how you answer those questions. What decisions will you make? Some thoughts I had regarding the London bombings six years ago, seem relevant today. Vengeance is always wrong; justice is right. Forgiveness is always right; forgetting can be foolish. These brief thoughts presented by my colleague, Pastor Glen VanderKloot, from a John Ortberg book and the passage of Scripture that inspired them from Philippians 4:4-8, is worth the short time it will take you to read them. We human beings can weave all sorts of horrible scenarios with the gift of imagination we have from God. Or, we can focus on what is true and real and noble. Doing the latter can make a huge difference in our lives and in the lives of those we touch every day. By the way, if you haven't read the book from which Glen quotes, The Me I Want to Be by John Ortberg, I recommend it highly! Last Sunday, we considered Jesus’ resurrection from the dead and asked the question, “But did it happen?” We looked at some of the evidence presented in Matthew’s account of the first Easter Sunday. That evidence, it seems to me, supports what we Christians say about Jesus: “He is risen, risen indeed!” This Sunday we come to another question: Do we believe it? Do we believe that Jesus, sinless God in the flesh, rose from the dead? That isn’t just a question of fact. Many believe it’s true that Jesus rose from the dead. But they aren’t believers. A friend of ours wanted her brother and his family to get involved in a church, knowing what a difference her own church had made in the lives of her husband, children, and herself and how in a bad news world, involvement in the church helps us hold on tight to the Good News about Jesus. One meaning of belief is to simply accept the facts of a case. Even Satan believes that Jesus is the Son of God and that Jesus rose from the dead; that doesn’t mean he’s in the Kingdom of God. It doesn’t make him a believer. We entrust all our lives, all our past sins, all our present fortunes, all our future, into the hands of one person alone. We don’t entrust our lives to ourselves, our efforts, or our understanding. We don’t entrust our lives to our country, our political philosophy, our families, or our ways of life. We entrust ourselves to the God revealed in Jesus Christ alone. We trust that Jesus alone can bring us into the presence of God, that the risen Jesus alone can bring us forgiveness of sin, that the risen Jesus alone will one day make our dead bones rise to new life in the eternal presence of our God. And we trust that Christ instituted the Church to help us believe in Him even as the devil, the world, and our sinful selves strive to drive us away from Christ. 1 Corinthians 12, verse 3, says that no one can confess that Jesus is Lord—in other words, confess that Jesus is the ultimate authority over our lives and over the universe itself—unless the Holy Spirit empowers us to believe it. Belief in Jesus, is a gift, something we can’t manufacture. In The Wizard of Oz, the Cowardly Lion tried to talk himself into courage. It didn’t work. Nor can we talk ourselves into believing in the risen Jesus. But we can decide to be open to the gift of faith. This is true of all gifts, when you think about it. A gift is offered, but we must decide whether to take it. People can look the gift of faith “in the mouth,” too, refusing it, just as our friend’s brother did. It’s part of the gracious, loving nature of God that He will not force us to entrust ourselves to Him. And though it breaks His heart, God lets us say, “No” to Him, giving us the final say over whether we live with Him or live in hell. To Abraham and Sarah, God gave the freedom to trust in His promises of a son and a nation of descendants. Sometimes they trusted in God. Sometimes they didn’t. When they decided to trust God, even when adversity struck, they lived in the calming, empowering certainty of God’s presence. When they decided not to trust God, chaos inevitably broke out. Through Read the Bible in a Year, we’ve seen that this same story played out in the history of God’s people after God freed them from slavery in Egypt; it’s because Israel decided with depressing frequency to walk away from God that what should have been an eleven day journey in the wilderness took God's half-believing chosen people forty years to complete! Every day, we have a choice, a decision. We must choose whether to be open to the gift of an ever-deepening faith that the God we meet in the risen Jesus offers us or to close our wills to Him, ignore the clear teachings of Scripture and go our own ways. Do we truly believe in the God Who raised Jesus from the dead? In the Old Testament, Joshua, the man God chose to replace Moses as leader of the Israelites, confronts the people with a decision. “Now if you are unwilling to serve the Lord, choose this day whom you will serve,” Joshua told them, "...but as for me and my household, we will serve the Lord." That is the decision that each of us must make: Whether to believe, trust, and serve the one and only God of the universe or not. Each of our Bible lessons for today address this reality. In the first lesson, part of Peter’s Pentecost sermon delivered ten days after the risen Jesus had returned to heaven, Peter confronts his fellow Jews with the truth that Jesus, according to the plan of God laid out in the Old Testament, though sinless, had died for the sins of all and had risen from the dead, an event he, along with 500 of his fellow Jesus-Followers, could vouch for. His sermon was a challenge for them to decide whether they would believe that the God of promise had fulfilled the promise of new life for all who believe in their time. “Do you believe it?” Peter asked. Psalm 16, from Old Testament times, challenged the people to believe that those who ran after other gods or ways of life were led only to trouble, but that those who trust in God are never abandoned. “Do you believe it?” the Psalmist asked. Jesus did many other signs in the presence of his disciples, which are not written in this book. But these are written so that you may come to believe that Jesus is the Messiah, the Son of God, and that through believing you may have life his name. Do we believe it? How we answer this question day-in and day-out is important not just for our lives beyond the grave. It’s important today. On February 25, a dear friend of Ann’s and mine died. Ron Claussen was the pastor of a neighboring parish when we arrived at our first call in northwest Ohio in 1984. Later, Ron became a member of the congregation I served, Bethlehem Lutheran Church near Okolona. But to describe Ron simply as a neighboring pastor or a parishioner doesn’t quite give you the right idea of who he was for so many people, including my family. Ron was, quite simply, one of the greatest people and greatest Christians I have ever known. He was certainly the finest pastor I ever met. Everything about him, including his wonderful sense of humor, displayed the risen Jesus Christ. When someone was hurting, no matter the time of day or night, Ron was there. I loved him more than I ever was able to tell him! But there’s more to Ron’s story. In the 1950s, during his teen years in Nebraska, Ron was among the last people to be afflicted with polio, just before the first polio vaccines came out. Polio, for the benefit of you young people, is a horrible virus that, without the vaccines we now take for granted, can bring about total or partial paralysis and can cause bones and muscle to shrivel and atrophy. Polio can do other horrible things to the body of someone who suffers from it. That Ron contracted polio when he did was a horribly, tragic occurrence that would impact the rest of Ron’s life. Its effects would have destroyed or embittered many people. But it did neither to Ron. I spent many hours with Ron, but I never once heard him complain about his circumstances. He radiated the certainty that can come to those who follow Jesus! Deciding to let God build faith in the risen Jesus within us helps us face each day with confidence, joy, and hope. We know that with Christ by your side, even when the world turns against us, we will prevail. We know that we can love as we’ve been loved, forgive as we’ve been forgiven, be as patient with others as God is with us. Through Jesus, you can can know that God is with you always and that, one day, God will welcome you into eternity with Him.